My usual Sunday run around the East Durham coast and Castle Eden Dene didn't appeal so I decided to have a slow run down the tracks to Thorpe Thewles, near Stockton. My plan was to run the 8miles to the old railway station at 70% heart rate have a cake and drink at the shop there then run back at 80% heart rate. Setting off I ran down nice and easy, then as I crossed the bridge at the A689 getting closer to Thorpe, I started to notice the tell tale signs that there might be a race on. As I approached the station, there was a contingent of Striders milling around the start/finish line. Danny Lim and Denise Benvin were there and after a quick chat I went off to the registration desk and entered the race with the start due in 10mins. So to the start, and off I set at a blistering pace for a man who had ran 8miles already. I eventually slowed as Danny passed before we turned off the tracks into the woods. There was short loop followed by a run back along the track before it turned off and contoured the fields. This led us on an undulating course back into the woods. I could see Danny edging away in the distance, his NYM training paying off. Back into the woods we dropped onto what I thought was the track back to the finish only to be guided off and up a cruelly steep ascent to get back onto the proper finishing straight. I finished the race absolutely shot and only then it dawned on me that I had to run another 8miles to get back home. I had spent my cake and drink money on the race entry and to say it was painfully slow getting back would be an understatement. Great fun though. I wasn't really sure what I was meant to do, and across the car park I spied a similarly perplexed looking individual. Wandering over I asked his advice. He shrugged in a relaxed manner, said it was his first race too, and we assumed, rightly, that by following everyone else, things would sort themselves out. That was 8 years ago and the stranger in the car park was Phil Owen. 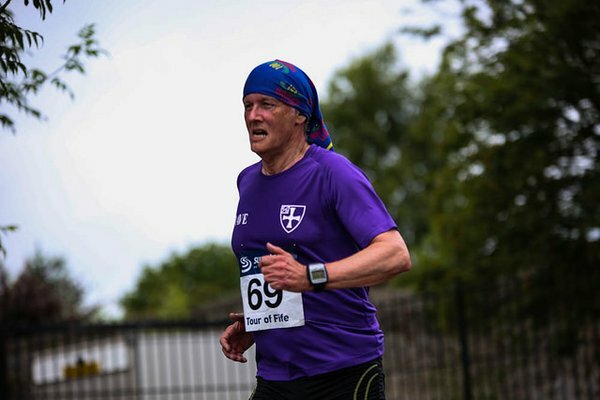 Neither of us knew at that time that Elvet Striders existed but even then the purple presence in the race was unmistakable. Back to yesterday morning and lying in bed a reminder on my phone told me that it was Jelly Tea time. I hadn't planned on doing this event as, being a point to point, I remembered it being a fiddly business. But closer reading showed that it now started and finished at the same place, and, importantly, there were entries on the day. I could feel another impulse purchase coming on. It was hot and calm at Hexham Racecourse and the drive up and up from Hexham to the venue were an indication of what we were in for. 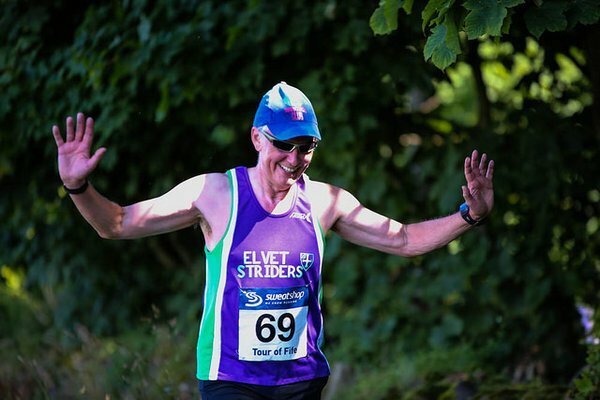 Much is written about specificity of training and this event has often been a favourite pre-taper 10-miler for those doing the Great North Run. However, as far as specificity goes, it shares little with the GNR. It's hilly. My word is it hilly! This all new course scours the quiet lanes south of Hexham, where there are an abundance of quiet, steep, endless hills. 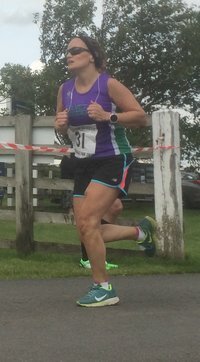 After a ropey season I'm still treating races as fact-finding missions, testing myself to see how my form is and what I might expect in the GNR in two week's time. I didn't feel lightning quick or fit but I didn't feel too bad either so I settled down and had an enjoyable 10 miles in the sunshine. I'm not sure what I think of the all-new course - I think I like it - and as long as you enter in the knowledge that the chances of a PB are negligible, there are far worse ways of spending your day. At first I thought this a ridiculous concept - run 5 x 1K laps around a pub, drink a half of beer after each lap plus a disgusting "snack" or canapé - I'm a Celebrity style - and then down a pint after the final lap. Apparently, such events occur all over the country - mainly as a fun way of raising funds for charity. And this is exactly what the Beer Belly Run was all about. The Grey Horse pub in Consett has been supporting the fundraising for Parkinson's UK, organised by Ian Pratt of Blackhill Bounders since early this year after a local teacher was diagnosed with the condition. This was the latest event and Paul & I decided to enter - and run in fancy dress which was "positively encouraged" on the entry form. 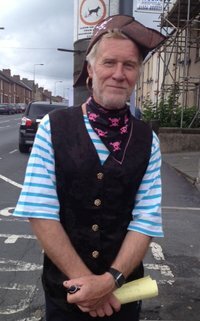 We turned up at the pub yesterday - a St Trinian's schoolgirl and a pirate - for the 3pm start. There were 3 Elvis impersonators running, a gangster and his moll, Batman and a fat bloke dressed as a baby to mention just a few of the costumes. There were also quite a few Blackhill Bounders who clearly meant business! Some of them had disappeared for a half hour warm up session - and then there was the "pre-race stretching". A mystery to most of the spectators! So we set off at a leisurely pace - Paul & I were running together! Hampered by a hockey stick and a boater that kept blowing off, I think I slowed things down a bit but then it wasn't really about the time. First lap done and the half to down and the "snack" to face - drivers (me) and "schoolgirls" (also me) were excused the half pint - not the snack - but had to do a 10 second penalty. Well, by the time Paul had drunk his half the 10 seconds were well over! And so it continued until we finished and the landlady gave me a well-earned glass of wine. 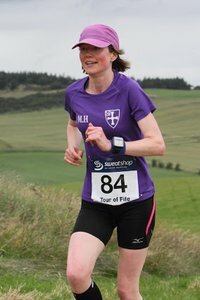 The fasted male was a Blackhill Bounder in 21 minutes, his wife was fastest female and oddly enough the fastest team was also the 'warming up' brigade from Blackhill Bounders. There are no 'results' or times but it was a great afternoon. 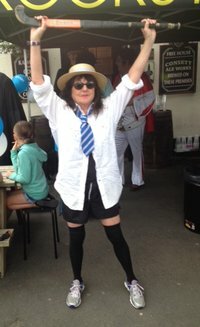 £757 was raised for Parkinson's on the day. The Rag Pickers band played to entertain the troops all afternoon and they were fantastic - they even did a lap playing their instruments. 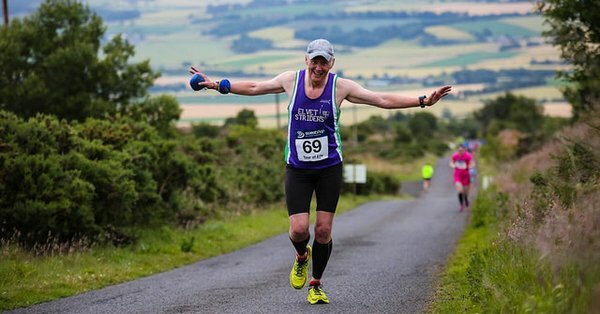 Ian Pratt tells me that Blackhill Bounders might put out a challenge to Elvet Striders for next year's team event ... so if you're interested in a really good day out you might consider getting a team together. Five runners to run 1 leg each! As part of my marathon training I wanted to run a fast flat road 10k on this exact weekend which left me with no good local options. A quick search pinged up Blackpool, while not exactly local this was described as flat, fast and on the right date to suit my needs. So I booked a hotel with the intention of having a weekend break exploring Blackpool and maybe hit the slots at the same time. Due to very happy coincidences I ended up with the striders number one supporter to cheer me on. 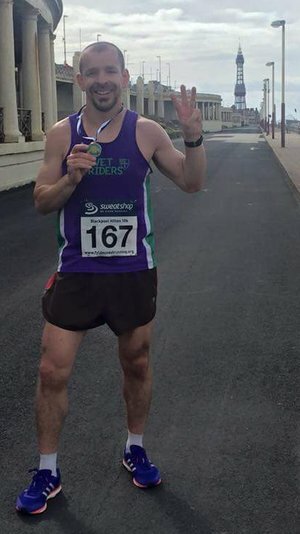 So the team strider consisting of one runner and one supporter, headed out to sunny Blackpool for a 10k adventure and to fly the purple flag with pride. The course is very much like the Hartlepool parkrun, perfect for fast racing. The wind was blowing along the sea front on my warm up as I started to see the fast lads gearing up for the show. From last year's results it looked like 33 min's for the win and maybe 36 for the top 10. So this was my goal with maybe an outside shot at top 5 if things went really well. Training was going fantastic due mainly to the coach Allan and my 2nd number one supporter at home. I felt in fantastic shape and really relaxed going into the race with a 35:30 PB only a few weeks ago at Darlington. A quick chat with some fast lads on the start line confirmed it was going to be a very fast and tough race ahead. The 1st mile loops back to the start and I got a massive shout out from my strider support star. Pace spot on, just about in reach of 5th place runner, a dream start and feeling good. The next few miles I raced hard and soon found myself running shoulder to shoulder for 3rd. The pace was way too fast to sustain but decided to keep at it and hope I slowed less than the lad next to me. Mile 3-4 you turn back and are faced with a few challenging hills. The pace slowed but thankfully a bit of distance started to form between me and my racing shadow. The last mile was ran in a state of shock and fear as I've never placed in a serious road race before and desperately hoping to hold it together. I saw the home stretch, took one last look behind, no one was in sight. I bounced towards the line with a massive smile on my face jumping like a mad man as if I had just won the race. It must have been an odd sight but this really was a total shock and a massive achievement I never really expected to achieve. Not a pb but still very quick at just over 36 mins and a good hard race to earn my very first top 3 placing. The reward for hard work, dedication and a slice of good luck as you never know who will turn up on the day. A race I will never forget and a very happy strider. 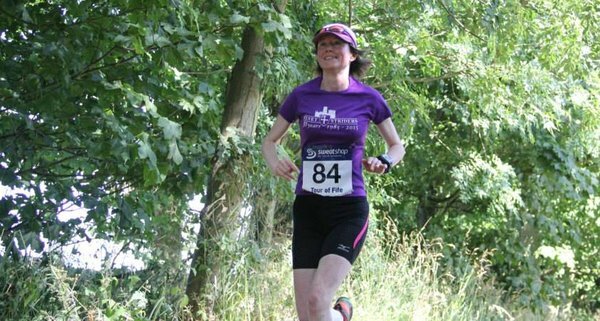 I fancied a change from the Darlington 10k this year and so I went along to the third of these trail races which are all held in Marsden Old Quarry. I never realised this area existed and it is very close to Marsden Grotto which is where the parking is for the event. It is a very low key affair, you can register online prior to the event (a maximum of 50 people can do this) or enter on the day. The cost of entry is £6. There are no race numbers to wear, you are given a number which you have to remember and give it at the finish. Marsden Old Quarry is a nature reserve and it is a good place to run. The course is two laps and a little bit. It has a few hills which are a bit testing and there is a great view from the highest point. It was pretty much all trail with a small section of tarmac path. It was well marked and marshalled and there was water at the finish. All the runners waited and applauded until everyone was back. Many of the runners went for breakfast at the Marsden Grotto afterwards. At the moment, this is the last race of the series, but the organiser is hopeful of putting on the race once a month, at least in the summer months. If you fancy a local, cheap, friendly trail race I would recommend this one. Darlington 10k has to be one of my favourite races of the year without question, it's fast, local, easy to enter and a very high standard to push everyone onto that all important PB. 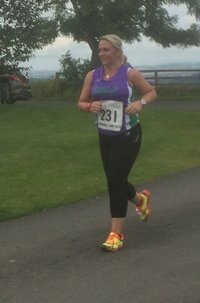 Last year this was a great race for me, I was in the best shape of my life and flew round in 35:45 which was still my 10k pb as I stood on the start line a year later with 51 fellow striders. The number 1 strider support crew were in full force with Catherine Smith and Flip leading the cheers on the day, this is a real boost for races like this and a big help and greatly appreciated by all. They managed to capture some fantastic pictures and made the day even more special for us runners, so a big personal thank you from me. I travelled down with 3 other fellow striders, parking up was easy and everything is very well organised. Good changing facilities, easy bag drop and central location for start/finish. Had a catch up with fellow striders then hit the road with speedy Rob and Simon for a good warm up. Not sure if its just me, but I felt a real buzz in the air, the weather was dry, no wind and the smell of PB was definitely in the air. My running lately has really started to improve due massively to the input of my coach Allan who has invested his time and effort into my training. This is something as a club that we are really blessed with as Allan also successfully trains many striders like me in the club. 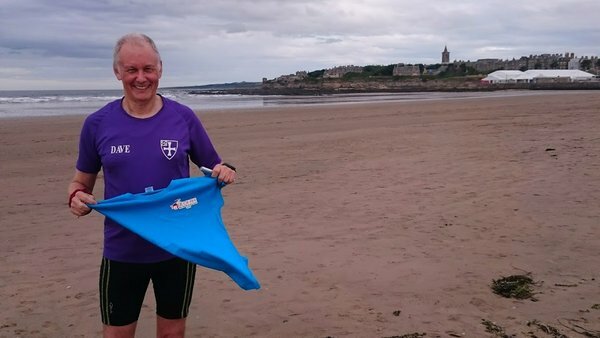 After the London I knew my normal/typical running low was on the way and Allan's 10k training program really helped boost my spirits with Darlington was my end goal. I had a plan for this race which almost worked to perfection, the first 2 miles were the key for a chance at that PB. 10 sec below 35:45 pace for those first miles, next 3 trying to pick people off and really go for it to the end. So off we went and 5:47 average for first 2 miles, a great start. Time to start picking up the pace and chasing people down. The plan worked well but the course really is not that flat and you can see this clearly in the mile split times. The down hill sections do make up for it very well but it is still challenging at times. 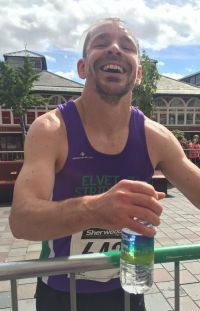 Running the course last year really helped, so i knew the finish was down hill and very fast, as you enter the shopping high street its really time to push hard for the line. I spent the whole race passing people and had a great battle with a Durham Harrier lad to the end and was a big buzz leaving him behind as I shot for the line. Now I kept a eye on my splits so knew it would be close to a pb, but had no real idea of my time in that last mile or as I crossed the line. A very happy and big shock as I saw 35:30 on my watch and a massive sense of joy with another fantastic PB I really did not expect to get any time soon. I was very shortly followed by rob everson @36:24 with another PB and showing great form over a distance that I know is hard for him. 49 striders were left to follow and all had a great run, comeback pb for coach Allan who somehow managed to fall towards the end and got spoiled rotten by the friendly first aid people after the race. Starting to learn this is standard for the coach and not his first trip . All showing great form and surpassing their tentative pre race predictions. Strong runs from Lesley Charman and Simon Gardner also, showing real running form at a tough distance. So another strider GP race done and I must admit to a sly happy grin when the nameless GP point hunter was unable to show. This due to being on an amazing holiday and really no contest when you have to decide a holiday or a GP run. Fantastic race and will definitely be here again next year. If anyone would like to share their thoughts, and/or links to more photos, ... send it in. 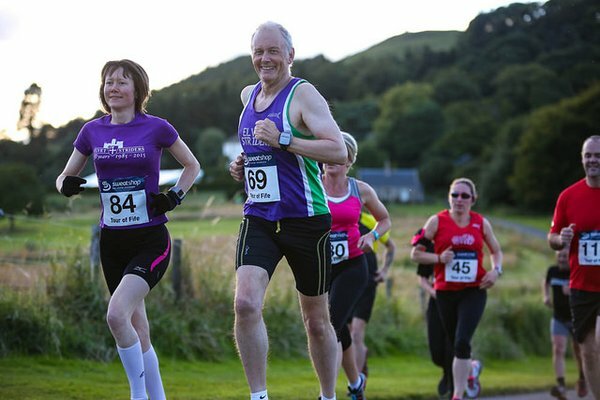 The Tour of Fife consists of five short races in five days at various locations in Fife. The races are all a bit different. I have done the Tour once before in 2011 and loved it and I had always planned to go and run it again. There are no prizes for each individual race, it is the overall times which count towards the prize giving after the last event. The number of entrants is limited to about 180, but only about 155 turned out. The five races can only be done by Tour entrants, so you start to recognise most people after a few days. This year the Tour started with a classic race, the Chariots of Fire race along the West Sands of St. Andrews. I loved it last time I did the Tour in 2011 and I loved it again tonight. There was a great view of St. Andrews from the beach. The amazingly big stands from the Open golf tournament were still there, but I guess they will go soon. After three days of running and walking the lovely Fife Coastal path, we were a bit unsure about how we would do, would there be much left in our legs ? Before the start we had the music from the film coming out of loudspeakers ! We started very slowly on this out and back route entirely on sand. We found our legs weren't too bad so after the first mile or so and we gradually started to increase our pace and overtook people. However, we were slowed by the sand getting softer and softer. We turned the corner at the end of the beach and to my surprise the turn around point this year wasn't in the sea, so I need not have put on a pair of old trail shoes. On the way out the breeze had been in our faces, but it was behind us on the way back and we made good time on the way back on the firm sand. Everybody was very friendly and the first person who approached us used to work in Durham and lived in St. Marys, where I now work ! The next person recognised us from the Northumberland Coastal Run ! This race was in the schedule when I last did the tour in 2011. Then it was 4.25m and three laps. This year's race was 3.1m and one lap which sounded more attractive. However in 2011 we didn't go up to the top of the big hill on the estate. We met a friend of Jon's tonight who also did the Elvet Striders Clamber last week, it is a small world. Then somebody who also did the Northumberland Coastal run just over a week ago. The runners were are very friendly and welcoming. The first couple of miles were fast and furious and hardly undulating at all. Melanie was setting quite a pace and I couldn't keep up, so I was slowly losing ground as we turned into the woods and started the very large climb to the top of the hill. There was a stile to cross and long grass to negotiate and some very upset sheep, but once we got to the top the view was fantastic. The plunge down to the finish was steep and potentially dangerous, but we had no problems and finished with a reasonable time considering the hill. This is only the second uphill time trial I have ever done, the other one being the same event four years ago. The logistics are a bit complicated. Everybody has to park at the top and run down to the bottom of the hill to start in pairs at your published start time. Last I underestimated how long it would take to run down and I was a bit late - they managed to slot me when someone didn't show. I made sure I got there with time to spare this year. The weather was awful when we parked at the top, driving rain, windy, it felt like November. Luckily as we set off down to the start, the rain stopped and wind dropped a bit. Melanie was starting 4min after me and I half expected to get caught, although she was a bit anxious about a hip problem which she could feel on the way down the hill. I started slowly, at least I thought I did. My partner slipped behind and that also made me think I was possibly going too fast (we were paired roughly according to speed, but the faster and slower pairs were spread evenly between the first and last starting times). By the time I got to 800m (the distances were chalked on the road), I was blowing hard and I continued like that until the finish. There was great support from runners running down to start their race, the two fastest runners were particularly encouraging. I decided to just hang on and keep running even if I slowed right down. Faster runners were going by me making it look very easy. As we got closer to the finish runners who had already finished were shouting, clapping, ringing cowbells, clattering pans and blowing whistles, a great atmosphere. There was also a piper and the race organiser on a PA. I managed to get to the finish without being caught by Melanie, but she did come in with a faster time than me - her hip wasn't an issue on the way up. I was about 45 sec slower than 4 years ago, but I don't think I had done so much exercise during the week as we have been doing this time [I think it's something to do with pretending to be an aeroplane, personally. - Ed.]. This race was only about a mile and half from where we are staying so it was great not having to drive too far. It was a very warm day although there was a steady breeze to cool us down. The route was two laps through the Cambo Estate grounds. It was mainly on narrow trails through woods, although there was one section through a field of cows who got a bit scared on the first lap. They were nowhere to be seen on lap 2. We started steadily and once through the cow field we started to pick up a few places. However, after about 1.5m I suddenly felt there was nothing much left in my legs. Almost certainly the cumulative effect of one of the busiest weeks for exercise that I have done for some time. This morning's relatively fast parkrun was probably not a good idea, but I wouldn't have missed it. People who I had overtaken started to pass me and all I could do was plod on as best as I could for the next 2.5m (except for a little showboating for the cameras), just waiting for the finish. A nice feature of the Tour is that there are three or four photographers there every day who post their pictures on FB and Fife ACs web site and they are happy for them to be copied. Melanie did much better than me, I lost places to people I had been close to before today, but Melanie gained places on people she had been close to. She also hit the wall like me, but much closer to the finish. The final race, 4.2m. Basically up a quiet road for 0.5m before turning onto a track which climbed and climbed for the next 1.5m or so. After a while the track turned into grassy fields and we made our way to the highest point next to a radio mast. Then it was almost all downhill on track but with a few muddy patches before it turned into tarmac for the finish. I started pretty much at the back as I didn't think I had much in my legs. I did overtake a few, but I ended up roughly where I was yesterday 116th out of 153. Melanie did great 80th. Over the five races I was 108th and Melanie 91st and we were both happy with that after a busy week. At the finish almost all the runners had stayed to cheer everybody in and there was a great atmosphere. We were lucky with weather again, it started to rain just as the last runner came into the finish. This seems to have happened just as we have finished our runs, walks and races this week. Not to hot, just perfect weather for exercising. We then went down to the Village Hall for sandwiches and cake - we had all been asked to bring a contribution to the food, a great idea, and there was lots to eat. This was followed by the presentations and spot prizes - we weren't lucky this time. One woman who had been doing well but had felt a bit dizzy and unwell had had to walk into the finish. If she had continued she would have been third woman but lost her place because of feeling unwell. They gave her bottle of wine which was nice gesture. We were up here for a week's holiday and could not resist taking in the local parkrun. This event is held a bit out of St Andrews at Craigtoun Park. It is a beautiful park and it looked great on a sunny morning. There are lots of things for children to do in the park - swings, slides, zip wires, boats, a short train ride. The park isn't very big so the course is three and a quarter laps. We probably shouldn't have been doing this with running the Tour of Fife as well, but we could not resist. I am glad we did it though, it is definitely recommended if you are ever in the area. We started off fairly steadily and we were surprised how much was in our legs after a tough uphill race the previous night. We sped up a bit, too much, and we finished quite a bit under our target of 30 minutes. We paid for this later in the day when running our second race. Afterwards we chatted to the first female finisher, a Tyne Bridge runner who was also up here on holiday. location: Sewerby Hall, Bridlington, East Yorkshire. Georgian house built 1720, additions 19th century, now open as 1910 restoration. 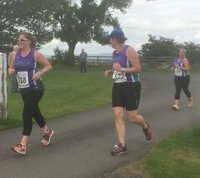 course: 2k out and back along clifftop, final 1k through Sewerby Hall gardens and woods. terrain: fast, slight gradients; winning time 16.39. I ran 26.5 on grass next to tarmac paths, woodchip in woods. atmosphere: welcoming, being a seaside resort they're used to visitors, marshalls gave lots of encouragement, all inclusive, the usual running buggies, juniors, walkers. They even have a visitors/comments book. victuals: Clock Tower tea rooms; parkrun favourites - bacon/ sausage baps/ latte. For a moment I feel on top of the world. I'm certainly at the top of England as for a brief second I stop to savour the moment. I'm 2hrs21mins into the race making slow, but steady progress, but I'm not here to break records, and certainly not Billy Bland's record of 2hrs34mins set some 30 years ago. That being the fell running legend that has, back at the foot of the first peak of Bessy Boot, held the gate open to allow us through unimpeded - I feel privileged. 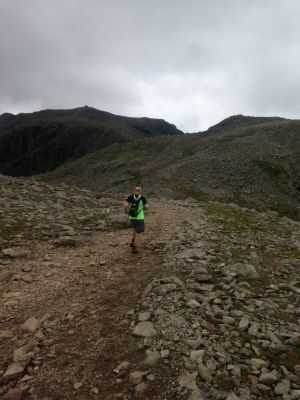 I'd longed to run this race since my very first hike to the summit of Scafell Pike and subsequent celebratory pint in the Scafell Hotel bar where, engraved on a wooden tablet hanging on the wall, are the names of all the winners of this classic fell race. Standing on the start line I felt a mix of excitement, nervousness and awe. I was now part of this race. I'd made the cut having ran the requisite qualifying races but I still felt a little out of place. Danny Lim has made the grade too and briefly joins me on the start line. The weather is kind as we set off. The field quickly spreads as we make our way along the Borrowdale valley floor before turning off for the steep ascent of Bessy Boot. My heart rate hits 91% so try to slow the pace but I also need to ensure I will be going fast enough to meet the cut offs. Checking in at the summit of Bessy Boot the race swings west along the ridge heading towards Esk Hause. It's undulating and following a period of heavy rain, the ground under foot is soft and boggy, so much so that guy in front sinks to his waist. This makes for hard running as we contour the ridge around Glaramara and Allen Crags. Eventually, Esk Hause is reached and we can make our way to Scafell Pike. The ground changes from soft, wet bog to hard, uneven boulder fields. This section requires a high level of agility and concentration to make it safely across. The summit of Scafell Pike is as busy as a local park and a thick mist briefly obscures the view but my main concern is the infamous scree shute that leads us back onto the corridor route towards Styhead Tarn. At the top I look down and there's a line of runners tentatively making there way down which restricts my desire to bound down wildly for fear of dislodging rocks that could potentially do significant damage to anyone in the way. Despite my reserve it's still a fantastically adrenaline filled descent but my shoes are filled with debris so I join the many others who've taken a moment to empty their footwear at the bottom. Once I've laced back up I head off down the corridor route which, can be treacherous in all conditions before cutting off and following a faint runners line towards the Styhead checkpoint. From here starts the solid climb up to Great Gable. The race line is straight up as we pass walkers zigzagging up the path. It's here I start to feel the strain and realise that I need to get more fuel and water into me. Checking in at the summit the route swings East towards Green Gable and across to Honister Hause. This section is a real struggle and a group of runners pass me as I begin to slow down. Thankfully as I reach the head of the ridge before the steep drop down to the slate mine at Honister I pick up but it's still painful. Honister Hause has a 3:30pm cut off, I get there with 10mins to spare. I'm happy to have made it but now have to tackle the 1mile uphill climb to the summit of Dalehead. I have issues with Dalehead after my visit here during the Teenager with Altitude fell race earlier in the year. The climb zaps me but my main concern is how my legs will hold up on the near vertical drop off the side to the tarn for the final run in. As expected, the descent is painful and I can only watch as those in front of me seem to glide away into the distance. But before long I'm back on level ground as the race snakes its way back through the farm at Rothswaite and into the finish field. As I turn the corner Danny is walking in the opposite direction which confuses me but then I realise he's not made the cutoff at Honister. I'm cheered in by quite a reasonable amount of people and it's only when I'm handed my race time print out that I realise just how long it's taken me to complete the race. I was thrilled to have got round, my body was battered, every muscle ached and I was covered in mud but I'll never forget the pleasure I got from having been part of a truly classic race.